...a new ride is in Town! Now Daddy's chair is good for a lot of things and this is one of those things we wish we would have thought of sooner! 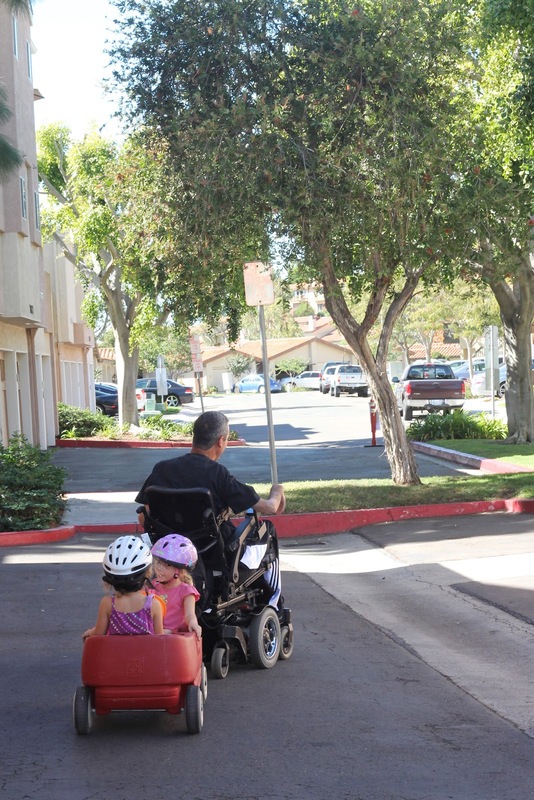 Last weekend my dad was down for a visit and while playing outside with Tony and the girls he decided to hook the wagon to the back of Tony's wheel chair. I am not sure who had more fun; the girls or Tony. Tony was going crazy with the wagon on his back, I believe the girls thought they were on a roller coaster ride. The pictures do not do justice for how fast these ladies were going or how many bumps and turns were included. I know they will be asking for this ride often!